Enter the Riverdale Vancouver Set Visit Sweepstakes now through July 21, 2018 for your chance to win a trip to the Riverdale Set in Vancouver, British Columbia. Trip Includes: Roundtrip economy class airfare, Hotel Accommodations, $1,000) gift card or cash or cash and more. Once you visited their website now follow the online instructions to register by entering all information requested on the registration form. Participant will then be presented with fourteen (14) questions regarding the television program “Riverdale.” Entrant will be required to submit the correct answer to all fourteen (14) questions in order to be eligible to win any prize. Prizes: One grand prize winner will win Roundtrip economy class airfare for the Prize winner and up to one (1) guest to the greater Vancouver, British Columbia, area (in the event that the Prizewinner is two hundred (200) miles or less from the greater Vancouver, British Columbia. Trip Consisting Of: a One Thousand Dollar ($1,000) gift card or cash or cash equivalent, Standard hotel accommodations in the greater Vancouver area for two (2) nights for two (one (1) standard room based on double occupancy); A visit to the ”Riverdale” production set in the greater Vancouver area if the show “Riverdale” is not canceled and still films its new episodes in the Vancouver area; and. ARV of all prizes is: $4,000. Who Can Enter: This Riverdale Comic-Con Sweepstakes is open only to legal residents of the fifty (50) United States and District of Columbia who are eighteen (18) years of age or older at the time they enter the sweepstakes. 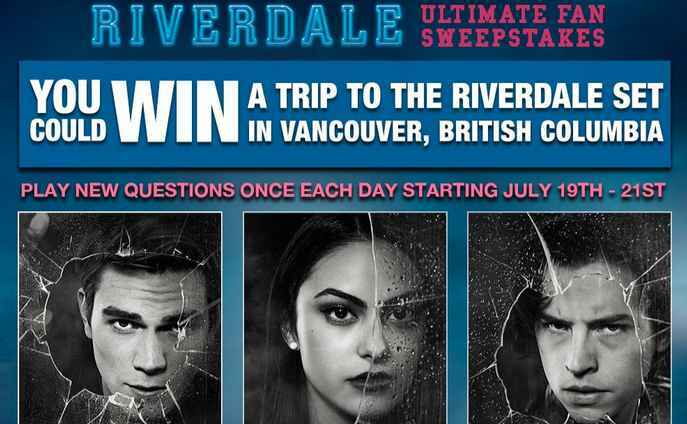 When To Enter: The Riverdale Vancouver Set Visit Sweepstakes entry begins on Thursday, July 19th, 2018, at 12:01 a.m. Pacific Time (“PT”) and ends at 11:59 p.m. PT on Saturday, July 21, 2018. Who’s Sponsor: The Riverdale Sweepstakes is Sponsored by Warner Bros. Worldwide Television Marketing.